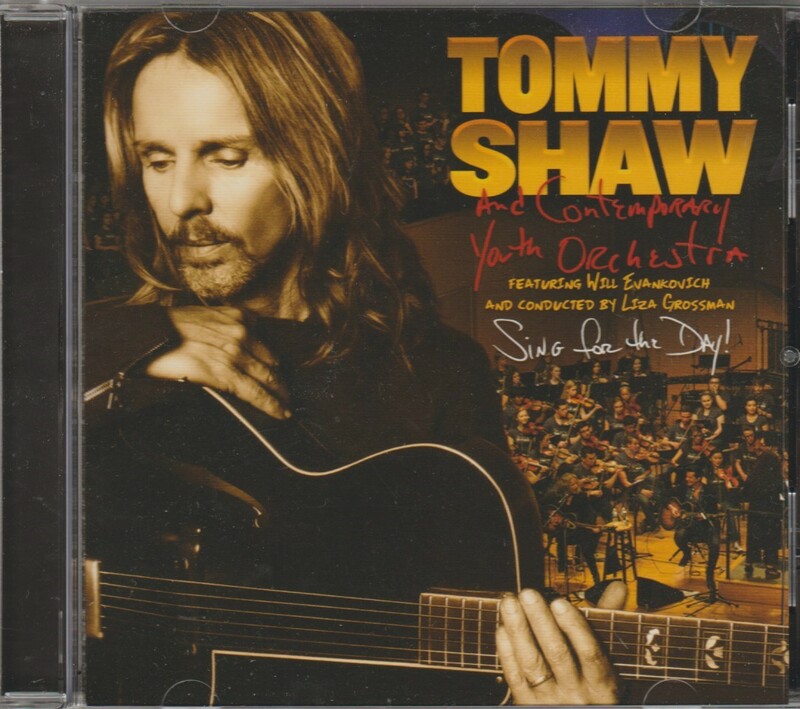 Tommy Shaw, accompanied by Will Evankovich, conductor Liza Grossman, and a whole orchestra full of highschool kids will blow you away on the live concert CD Sing For the Day! It’s astounding to think that this room full of kids is so good that they got to perform the hits of Shaw with the master himself, and get it released as an album. What gifted young musicians they must be. Styx fans will adore Sing For the Day! for its roll call of classic songs, performed acoustically with the orchestra. Styx music lends itself well to that kind of pomp and circumstance. The album also boasts a number of Shaw favourites outside of Styx, like his first solo hit “Girls With Guns”. With a new arrangement, “Girls With Guns” is almost unrecognizable but yet familiar. You’ll also get Damn Yankees’ excellent “Come Again” and of course their hit ballad “High Enough”. The album commences brilliantly with “Overture” from the newest Styx album The Mission. Bar now set “high enough”, they run through “Girls With Guns”, “Too Much Time on My Hands” and “Fooling Yourself” with aplomb and joie de vivre. You wouldn’t be going out on a limb to suggest that these kids do as good a job of it as Styx themselves do. “Crystal Ball” soars majestic. “Boat on a River” simmers quietly. Most of the arrangements offer a freshness while being true to the spirit of the originals. The only sputter is “Renegade”, which is stripped down and a little strange. Set highlights include “Diamond” from Tommy’s 1997 album 7 Deadly Zens, a pretty incredible track. “Come Again” is brilliant, as is the bombastic oldie “Man in the Wilderness”. “Blue Collar Man” is among the best versions of the song ever recorded, and completely different from the original. Fans should enjoy just about the whole shebang. Casual listeners would recognize a number of these songs and might get a kick out of these novel interpretations. Do not hesitate if you happen to find this CD in the wild. It’s better than you might expect.